Alaska pollock is also known as Theragra chalcogramma and walleye pollock. The fish can be found in the North Pacific Ocean, which is also known as FAO fishing area 67. Alaska pollock is the second most important fish species in the world in terms of total catch. As a supplier we sell our fillets pin bone in, boneless and skinless. These fillets can also be layered into a block mold and deep-frozen to produce fish blocks, which are often used for battered and breaded fish products such as fish sticks. We also have battered Alaska pollock fillets available at our ‘Added Value’-page. We mainly export our Alaska pollock fillets to Germany. But please do contact our sales department. We’re delivering through whole Europa and the UK. Alaska pollock is a fish that lives particularly in the Pacific Ocean. 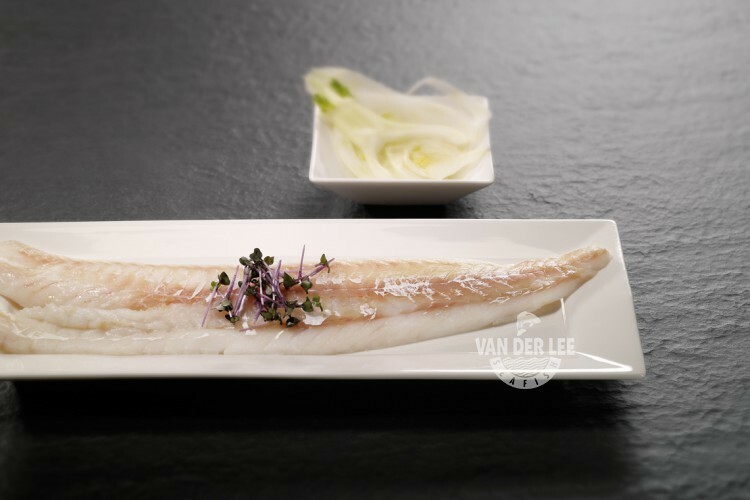 Our Alaskan pollock is often wild caught around Dutch Harbour and the gulf of Alaska. Since this is quite far away we have to import the fish all the way from China. However, we can ensure you that our imported fish is processed, packed and transported in perfectly high conditions since we know our suppliers personally. When the fish is caught it is most of the times frozen and filleted aboard. However, sometimes the pollock is filleted in China itself. Alaska pollock has a speckled colouring. This makes it more difficult for predators to see the fish when it is near sandy ocean floors. Compared to pollock, the Alaska pollock has a milder taste and a lower oil content. The fillets have a mild and delicate flavour. They are high in proteins and low in carbohydrates, which is the case with any fish product. Alaska pollock fillets contain only around 75 calories. They also contain the vitamins B1, B2 and B12, which help keeping the body’s nerve and blood cells healthy. However, Alaska pollock is consumed in a lot of countries. For example, the fillets of the fish are commonly used in dishes in global fast food chains. Salted or smoked pollock roe is used a lot in Japanese and Russian cuisines. This is one of the reasons why most of the times the roe of the Alaska pollock is cut off and exported to Japan. Alaska Pollock fillets can be grilled on the barbecue and served with a salad too. You can also serve the fish with a sauce or vegetables.